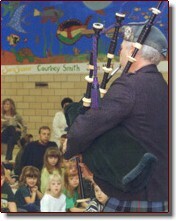 I am generally available for bagpipe music performances on either the Great pipes (piob mor) or the quieter bellows-blown smallpipes. 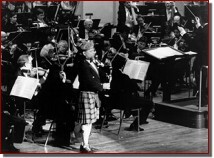 These include concerts, recitals, weddings, family reunions, festivals, funerals and other special events. I play a wide variety of airs from the Scottish, Irish, and sacred (hymnal) repertoires, including pipe marches and the full range of traditional Irish and Scottish dance music. I always do my very best to produce a first-class sound for each performance. Send a request via email, phone, or fax and I shall be glad to offer my suggestions for the most appropriate pieces of pipes music for your special occasion. 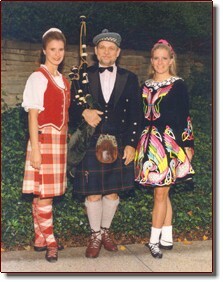 For example- if you are planning a wedding, I'll send you my CD of Bagpipe Music for Weddings for free. It contains musical selections grouped according to the main stages of a wedding ceremony: Prelude, Processional(s), Meditation(s), Recessional, and Postlude music. For concerts and festivals I also perform in an ensemble called Road to the Isles, featuring five performers on the fiddle, flute, pipes, guitar, vocals, Irish Step dancing and Scottish Highland dancing. 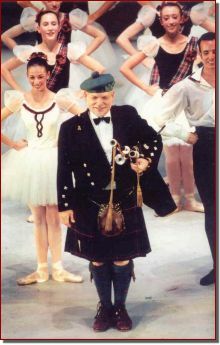 For school performances I perform with The Wind that Shakes the Barley, a trio consisting of myself, an Irish Step dancer, and a Scottish Highland dancer. Promo kits and photos are available for both shows. In addition, Road to the Isles has a dvd for presenters, and The Wind that Shakes the Barley has study guides for educators. References for any type of performance are available upon request.